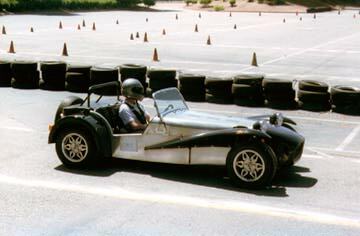 My car is a Caterham Super Seven, assembled in 1985 by Greg Rice, and completed in 1986. It is the Sprint version, with the 2270 Ford Range Engine. I purchased it in 1987 with 12,000 miles on it. I have modified the suspension extensively. It now has a separate sway bar and upper A arm and now can be adjusted for camber and castor. The lower A arm has a reinforcing bar to keep the legs of the A arm from separating. The rear axle still uses the A frame but now has a spherical joint to attach to the differential carrier. The alignment is 1.5 degrees negative camber and 7 degrees castor. The engine was stock, sort of. It has dual Weber 40DCOEs and headers. I have added an electric fuel pump (Carter vane type) and pressure regulator(Holley). I have also added a Luminition electronic ignition (hall effect) and tried the Luminition Rev Limiter with poor results. The chassis dyno says I am getting 76 horsepower to the rear wheels. This is less than expected and no reason found thus far. The engine was rebuilt, starting in November 1995. Here are some notes on the rebuild and a description of the first start. Mike Stimson, of Pacific Performance in Redwood City did the work. The power is up 50%, really! Amazing to drive. The chassis dyno notes show 100.3 hp at the rear wheels, or about 136 hp (British) at the engine. In anticipation of all this power, I converted the rear differential to a Quaife torque sensing unit. Before I could just tromp on the accelerator on corner exit. Now I have to moderate the pedal! Tire technology has left the Seven behind. I started with A008 tires from Yokohama. I measured 1.25 steady state lateral acceleration. When those wore out, I tried Yokohama A008 RS, RS II, BFG R1 and Hoosier (both radial and bias ply). None worked because the new tire technology requires the tire be brought up to temperature to stick. Unfortunately, the light weight, 1250 lbs with me in the car, is insufficient to work the tire and generate temperature. I now am able to generate slightly over one gee of lateral acceleration. I am currently using Yokohama A032, which stick but not as well as the original A008. I converted my original radiator to the new aluminium specification. My driving inpsires some humor. I play with the Seven as often as possible. My favorite event is the autocross. Above, pylons mark a slow speed course in the local college parking lot. The event is timed, so there is no risk of bumping into another car. You must negotiate the course as quickly as possible, carefully placing your car within inches of the pylons. Many of the skills required are similar to road racing, only at much slower speeds and with nothing to hit. You also learn the limits of you and your car, which will help in emergency avoidance situations.